As my love for Indian food deepens, I want to learn more about cuisines specific to India's different regions. After all, in such a large country with varying climates, the dishes that develop should draw upon ingredients from the area. 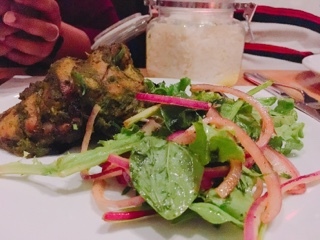 Just like there’s no single definition for Italian, French, or Chinese food, Indian food can also vary greatly from region to region. Hence, when Parv informed me about a Goan feast by Pukka through UFeast ($70), I was intrigued. 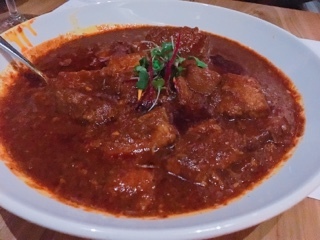 After all, so much of what we generally eat is from Northern India (think butter chicken) that it’d be an excellent opportunity to taste something different. Entering Pukka, there were at least 40 people in attendance, also excited to tuck into the special menu Harsh Chawla and Derek Valleau designed exclusively for the gathering. While Pukka’s normal menu is inspired by the North, for this event, they looked to the coastal area in the West creating a menu that’s spicier than their traditional offering but still following their principles of using ethically sourced meats and building flavourful dishes. Accompanying the feast were wines from Rioja, a north central region in Spain. Famous for their Tempranillo, this was a chance to taste some of their other varietals. Before the meal, we sipped on a 2016 Hacienda Lopez de Haro Rosado, a rosé for those who don’t like the sweeter wine; I found it much dryer, but still giving off a fruity essence. 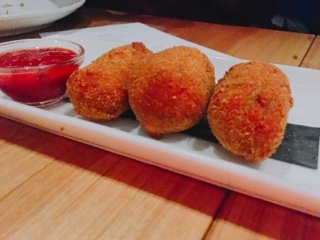 With the appetizers we continued with the lighter wines with a 2016 white and rosé from Baron de Ley, the refreshing white went especially well with fried appetizers like the vada. 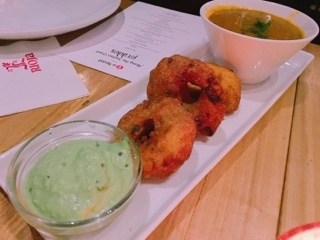 The lentil fritters were plain on their own but were the perfect vessel for enjoying the accompanying sauces: herby coconut chutney and a hot sambar, a fragrant lentil vegetable stew that we couldn’t get enough of – as the commercial says… I put that s**t on everything. 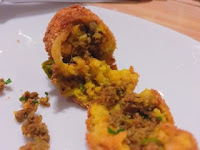 The beef croquette had a great thin crunchy exterior and was filed with minced beef, onion, and other spices. 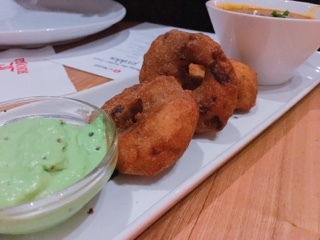 The spicy tomato chutney really had some heat with it; thankfully, the coconut chutney from the vada helped to cool my tongue when I went a bit gung-ho with the spicy sauce. 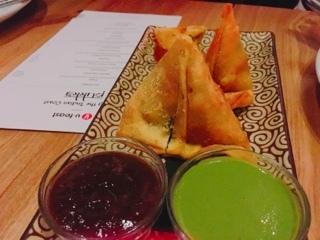 In Canada, we’re well versed with a samosa. so when the chamuças arrived the pastry pyramid looked familiar, especially with the tamarind sauce. But once you got inside the filling was more orange - my best guess is it was a spiced yam with carrot slivers given there was sweetness to it. 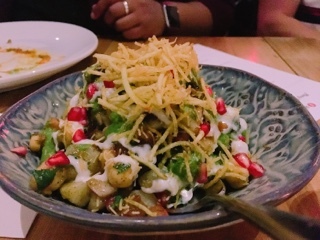 Pukka’s aloo chana chaat is the best chaat I’ve had! While it incorporates different sauces, their version shows restraint so the condiments aren’t the entire experience (my general dissatisfaction of most chaats I’ve had). Plus there are tons of contrasting textures: soft diced potatoes, meaty chickpeas, juicy pomegranate seeds, and crispy vegetable strings. Each forkful was delicious and if it weren’t for worrying that I’d be too full for the mains, seconds would definitely be in order. As the dinner progressed into the mains, three red wines arrived allowing us to mix-and-match with the dishes: a 2014 Beronia Tempranillo Rioja, 2012 CVNE Cune Crianza, and 2012 Beronia Reserva. The Tempranillo didn’t disappointment with tons of berry flavour amongst faint tannin. The Beronia Reserva was what I enjoyed the most, a more robust wine that held its own against the spicier foods. In general, we learnt that fruity wines help to cut through the spices, much like fruit chutney. It was ideal that they’re all found at the LCBO and at under $20 a bottle, picking one up for future meals won’t break the bank. 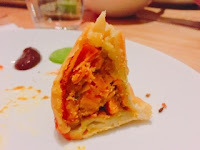 The mains started out innocent enough with the chicken cafreal, which reminds me of tandoori except with more herbs ending with a coriander finish. It’s not overly exciting and a bit bland compared to the appetizers, but was nonetheless tender and a nice “break” before getting into the really hot dishes. And the heat started coming, first in the pork vinha d'alhos, where the spiciness was tempered with garlic and vinegar so it’s still bearable. The pork belly was outstanding, braised until it turned into a soft pool that melted onto the tongue, helping to protect against the spices. On the other hand, there was no respite with the prawn balchao – from start to finish the tomato sauce had a fiery kick! 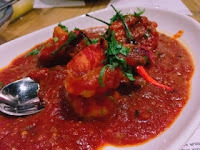 From what I could muster, the prawn was cooked nicely; the sauce was just too much for me. 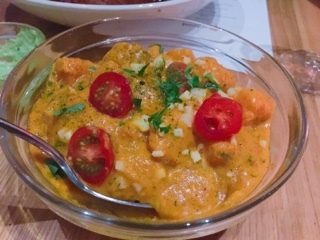 Hence, it was smart to end the mains with a coconut pumpkin curry, its creamy sauce helped to numb the pain from the prior dish. Surprisingly, it was a delicious – here I thought pumpkin would be too sweet and bland. Yet, with mustard seeds and enough salt, the dish stayed savoury and went so nicely with the steamed basmati rice. 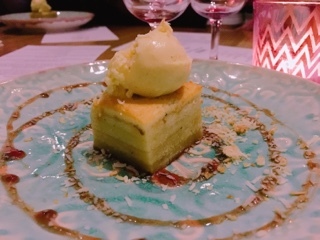 After all the spicy mains, the cooling ice cold bebinca was a great choice for dessert. The cake wasn’t too sweet but even a small slice left me sedated thanks to the creamy coconut milk, ghee, and egg custard layer between the cakes. 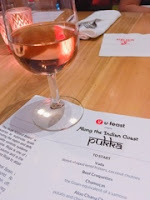 At $70 a person (inclusive of taxes and gratuities), I was pleasantly surprised by the amount of food and wine we were served at the Pukka’s Goan feast. Not only did I get a chance to catch-up with friends but we met some interesting guests as well – after a few glasses of wine people definitely started letting loose! Sounds like fun? You can check out UFeast using my referral link and get $10 your first meal.